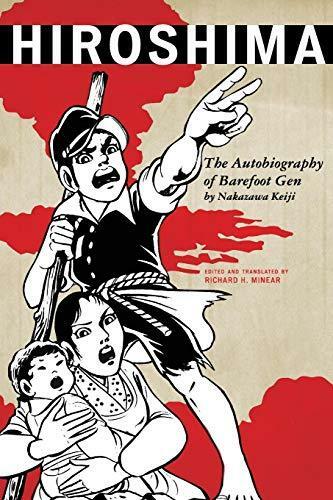 Prose autobiography from the creator of BAREFOOT GEN, invaluable for students in prising apart the fiction from the heavily autobiographical elements in the classic, harrowing manga series. "This compelling autobiography tells the life story of famed manga artist Nakazawa Keiji. Born in Hiroshima in 1939, Nakazawa was six years old when on August 6, 1945, the United States dropped the atomic bomb. His gritty and stunning account of the horrific aftermath is powerfully told through the eyes of a child who lost most of his family and neighbours. The narrative continues through the brutally difficult years immediately after the war, his art apprenticeship in Tokyo, his pioneering "atomic-bomb" manga, and the creation of Barefoot Gen, the classic graphic novel based on his own experiences before, during, and after the bomb. Despite the grimness of his early life, Nakazawa never succumbs to pessimism or defeatism. His trademark optimism and activism shine through in this inspirational work."